Nowadays, everything gets a sequel. If a movie doesn't have a sequel, something's wrong with it. Case in example: Cube. A low-budget movie from Canada that received much critical acclaim, it was only time before a sequel was made. And as of this writing, a third one is in production. See? Sequels and trilogies really are taking over Hollywood, even the "direct-to-video independent movie" market. Anyway, I'm getting sidetracked. I have a review to do. The movie's plot is similar to the first Cube, yet with a few twists. Our story revolves around seven strangers: Kate Filmore (Kary Manchett), detective Simon Grady (Geraint Wyn Davies), blind college student Sasha (Grace Lynn Kung), Jerry Whitehall (Neil Crone), video game designer/computer hacker Max Reisler (Matthew Ferguson), the senile Mrs. Pasley (Barbara Gordon), and Julia (Lindsey Connell). The seven find themselves trapped in a futuristic "hypercube," where the rules of time and space have absolutely zero relevance. We soon see various alternate realities and timelines within the hypercube begin to overlap, and those realities and timelines quickly begin to collapse atop one another as the group tries to find their way out. I loved the original film, and I was quick to watch the sequel when I saw it air on the Sci-Fi Channel. Predictably, Cube 2 borrowed some from the original. But that's unavoidable, because what else can you do in a setting like this? While I do appreciate the sequel for trying to further the story behind the existence of the cubes and trying not to give the viewer the same thing, the movie is still a mixed bag. On the downside, the need to explain the origin behind the cubes dented the original's ambiguity. Another faux pas was the lack of unpredictable and random booby traps that gave the original its excitement. The sequel only had one really fake-looking CGI shredder. Cube 2 also spent way too much time talking and not enough time being exciting. I don't always have a problem with that, but the dialogue was just so horrible. It made the actors look bad and the characters look worse. I also disliked the bright lighting and each room's white walls. In the original, the varying colors of the walls added to the mood of each scene. But here, it's harder to get an emotional grip for things, and it's tougher to connect with how the characters feel. On a positive note, the concept behind the movie is neat. It gave the filmmakers carte blanche to mess with our heads and make the movie as weird and psychedelic as possible, and they tried. Norman Orenstein's techno-esque score can be chalked up in the "thumbs-up" column as well. I also thought that hiring Andrzej Sekula as both director and director of photography was a good idea. His background in cinematography (you might have seen his name attached to such movies as Reservoir Dogs, Pulp Fiction, and American Psycho) really helped the movie. The idea of timelines and alternate realities overlapping was a great way for creepy sound effects to work their way into the movie too. Had the rooms been a bit darker (see also: my beef with the wall color), it would have almost been like a haunted house. In the acting category, I really liked Geraint Wyn Davies as Simon. Even though Simon is built as the villain over the course of the movie, he ended up being the only likable character in the movie. I thought Simon's growing collection of watches and nametags near the end of the movie was a neat twist, but that's just me. The rest of the cast was okay with the horrible script, but I absolutely hated the character of Mrs. Paley. I just wanted to reach through my TV screen and smack her around. Mrs. Paley is probably the single worst character I've ever seen in any movie ever, quite possibly worse than Heather Donahue in The Blair Witch Project. She's that awful. There's just so much you can do with the concept of people trapped in a maze of cubes, and Cube 2 at least made an attempt. Unfortunately, it tried too hard with too little, and it ultimately came off as being a Sci-Fi Channel Original with a bigger budget (which is odd, considering I first saw it on the Sci-Fi Channel). A lot of the mystery and tension from the original were gone, and the dialogue is crap, but the trippy audio experience and the neat idea behind a "hypercube," as well as having a lunatic you can cheer for, boosts my rating a little. 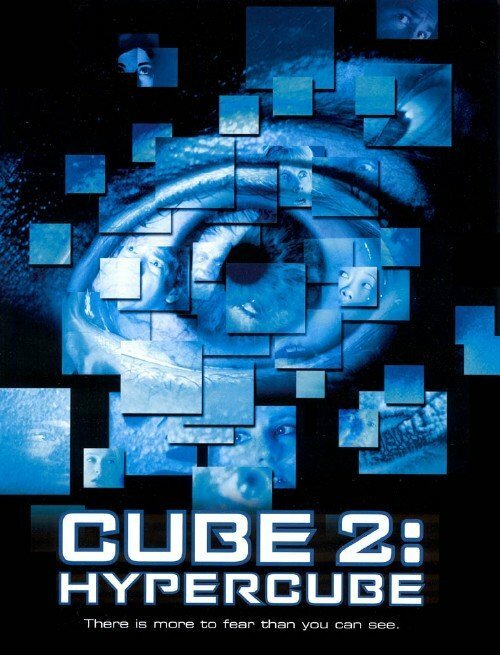 Overall, I'll give Cube 2: Hypercube two stars. Not awful, but nothing that you should beat yourself up over if you miss it.